I had been in the mood for making muffins for a week now and since I am hunting for a muffin recipe that would give muffins that look like the ones you buy at the bakery (with beautiful dome tops) I decided to try Nigella’s chocolate muffins. Everything went well at first. I prepared the batter, and prepped my muffin pan , taking pictures to show you guys. When I was about to pour it into the pan my gut feeling told me that the batter is too runny. Did I listen to it? I placed the pan in the oven looking forward to my delicious muffins that were only 20 minutes away. I checked on them after 10 minutes, they were rising nicely and beginning to dome. 5 minutes later I smell something burning! I run to the kitchen and I am shocked to find miniature erupting volcanos instead of my muffins! The batter not only overflowed…oh no..it spread all over the pan and was dripping all over my oven! My craving cost me 3 hours of scrubbing and cleaning! My hands actually hurt from all the detergent and the scrubbing I did..at some point I considered throwing out my muffin pan and my oven rack .. So what have I learned from this whole experience? I should just buy my muffins from now on I should look for a new muffin recipe. Now back to the title of this post. My friend Dee of Deelicious sweet was very kind to try one of my recipes. You can click here to check out her delicious take on my Chicken fajita with deconstructed guacamole (I have to warn you that her pictures are not to be watched on an empty stomach…you may risk eating your screen). In a medium saucepan, combine peas, water, and salt. Bring to a boil, then stir in butter. In a small bowl, whisk together cream, flour, and sugar. Stir mixture into peas. 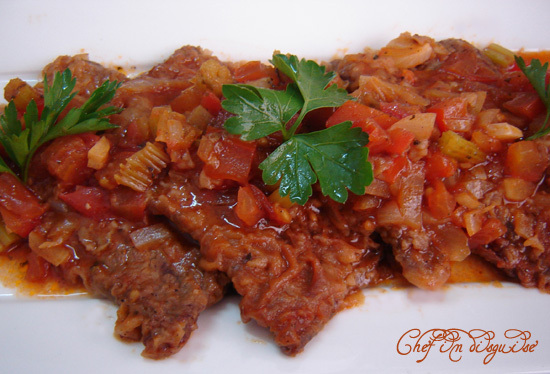 Cook over medium-high heat until thick and bubbly, about 5 minutes. 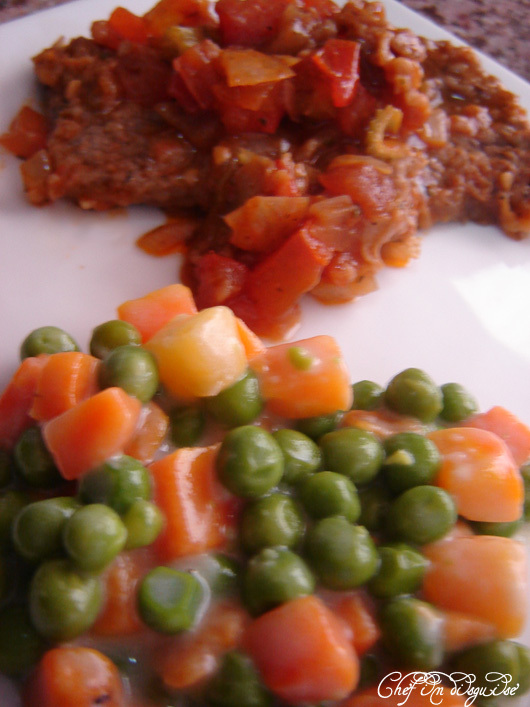 Posted in Meat and tagged creamed peas, disaster muffins, postaweek2011, steak, swiss steak. Bookmark the permalink. Yum! Your pictures are drool worthy! I want that for dinner again. 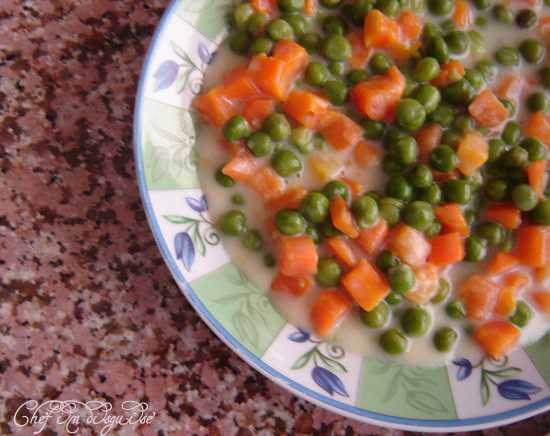 I love how you added carrots to your creamed peas. I wonder if I could get by with that? My kids hate cooked carrots. Sorry to hear about your muffin disaster! All thanks go to you Dee for the wonderful recipes..my family loved them ..
Oh wow I saw this recipe at Dee’s site, and she’ll be really proud of you! Your version looks so yummy just like hers. Wonderful! We’ve all had disasters in the kitchen. I mean I haven’t for years, but you know. I love the peas recipe. Great post. The blow that doesn’t kill you makes you stronger…right? And I’m glad your supper turned out well, it looks delicious! I can’t wait to try out your recipe..thank you so much for sharing the link..
We don’t get fresh blueberries here..have you ever tried them with any other fruits or nuts? I’m sorry about the muffins, I used to think that happened to only me because I wouldn’t use eggs or substitutes and butter : )) The recipe looks beautiful. Thank you for stopping by and appreciating my first daring bakers’ challenge. An adventure indeed…actually when I think about it, it was more like a chemical lab with all the things I tried to get the burn batter off! I’m really enjoying browsing your blog. It’s so welcoming! I know this is the wrong post, but mine would also be green, mint, but add sweetener. OH—and the muffin thing–awesome! You should have posted it just for fun and a giggle. Wait, maybe you did—back to browsing! Thanks for visiting my blog, I really appreciated that.